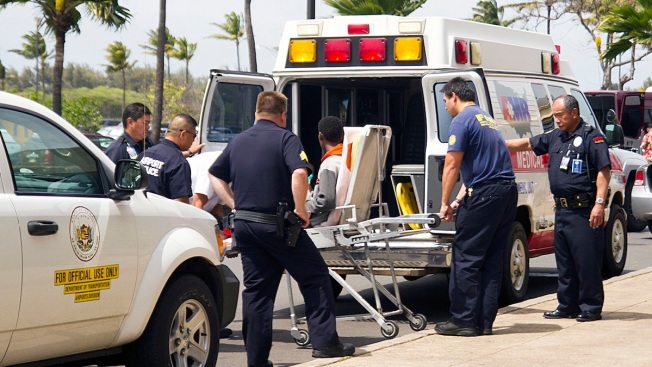 A 16-year-old boy, seen sitting on a stretcher center, who stowed away in the wheel well of a flight from San Jose, Calif., to Maui is loaded into an ambulance at Kahului Airport in Maui, Hawaii Sunday afternoon, April 20, 2014. A 15-year-old boy scrambled over an airport fence, crossed a tarmac and climbed into a jetliner's wheel well, then flew for five freezing hours to Hawaii -- a misadventure that stirred concern about possible weak spots in the security system that protects the nation's airline fleet. The boy, who lives in Santa Clara, Calif., and attends a local high school, hopped out of the wheel well of a Boeing 767 on the Maui airport tarmac Sunday. Authorities found him wandering around the airport grounds with no identification. He was questioned by the FBI and taken by ambulance to a hospital, where he was found to be unharmed. 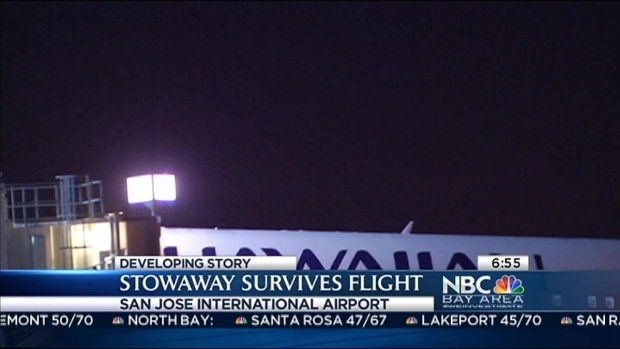 A Santa Clara teenager survives a flight to Hawaii, by clinging to a wheel well. Christie Smith reports. On Monday, authorities tried to determine how the boy slipped through multiple layers of security, including wide-ranging video surveillance, German shepherds and Segway-riding police officers. That airport, in the heart of Silicon Valley, is surrounded by fences, although many sections do not have barbed wire and could easily be scaled. The boy climbed over during the night, ``under the cover of darkness,'' San Jose airport spokeswoman Rosemary Barnes said Monday. Hours later, surveillance video at Kahului Airport showed the boy getting out of the wheel well after landing, according to a statement from Hawaii's Department of Transportation. The video was not released due to the ongoing investigation. ``Our primary concern now is for the well-being of the boy, who is exceptionally lucky to have survived,'' Croyle said. ``I have long been concerned about security at our airport perimeters. (hash)Stowaway teen demonstrates vulnerabilities that need to be addressed,'' tweeted Rep. Eric Swalwell, a Democrat who represents the San Francisco Bay Area's eastern cities and suburbs. In August, a 13- or 14-year-old boy in Nigeria survived a 35-minute trip in the wheel well of a domestic flight after stowing away. Authorities credited the flight's short duration and its altitude of about 25,000 feet. Others who hid in wheel wells have died, including a 16-year-old killed aboard a flight from Charlotte, N.C., to Boston in 2010 and a man who fell onto a suburban London street as a flight from Angola began its descent in 2012. The FAA found that all wheel-well stowaways will lose consciousness at high altitude from lack of oxygen, and that their freezing bodies go into a state somewhat similar to hibernation. At 38,000 feet -- the cruising altitude of the Hawaiian Airlines flight -- the outside air temperature is about -85 degrees. That would usually be deadly, but some people survive because their breathing, heart rate and brain activity slow down.